New deal at Lawson's Landing spells the end of an era—but will it also be the end of Lawson's? It's a sunny Saturday morning in July at Lawson's Landing at Dillon Beach, achingly beautiful and breezy, as Bob Bedsworth ambles down a sandy path, a bright-red five-gallon bucket of spent horseneck clamshells in hand. He has just finished giving a shucking lesson to one of his grandkids from the back deck of his trailer at the campsite. It's a scene that's likely been repeated hundreds, thousands of times at this popular campground. Bedsworth is retired U.S. Air Force, has a home in Elk Grove and spends five months a year in his trailer at Lawson's Landing, from May through September. He's been coming here for 34 years. But those days are coming to an end, as Lawson's faces an uncertain future. Bedsworth owns one of the 200-odd semi-permanent camper-trailers perched along the edge of Tomales Bay. They'll all be gone by this time next year. That move is a key piece of a long-in-the-making deal struck in 2011 between Lawson's Landing and the California Coastal Commission to keep Lawson's open. But ask Lawson's owners and they'll tell you that, because of financial and regulatory challenges, staying open is by no means assured. Bedsworth recalls the clamming, the abalone diving and the general good times he's had over the decades he's been coming to this rather remote and free-wheeling campground, where the cattle once ran free on an adjoining ranch also owned by the Lawson family. "Where else can you find a place on the bay that's reasonably priced and where you can bring the kids, the grandkids," says Bedsworth. "I'll miss that." Under new rules designed to save the endangered red-legged frogs, famous Tomales dunes and snowy plovers, Lawson's will have to abide by state laws that restrict people from coastal camping for more than two straight weeks at a time. The idea is to give other people a shot at camping at the location and to protect sensitive habitat. But once those camper-trailers are gone, Lawson's owners say they will have to provide access to a more well-heeled crowd of luxe campers as part of its plan to stay afloat. And that may not be enough, the owners fear. Bedsworth peers over the top of his rectangular sunglasses and says with a soft smile, "I'd just as soon it not happen. I think it's stupid." He heads off to dump his bucket of clamshells into the sun-dappled bay. 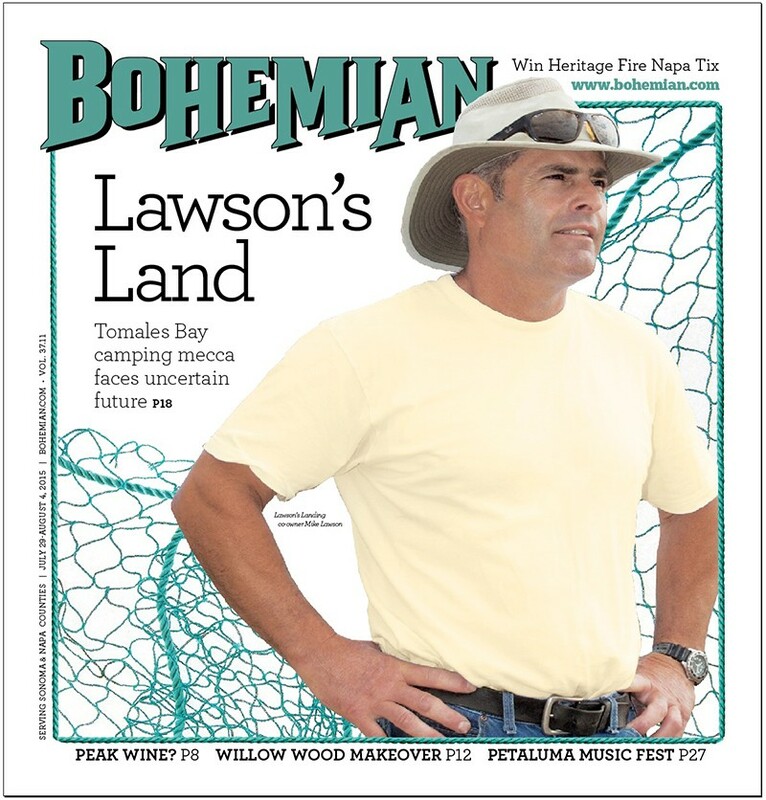 Lawson's Landing has been a family business in northwestern-most Marin County since the late 1950s. The family has owned the land, which until recently comprised some 1,000 acres, since the 1920s. The camping scene has historically been dominated by blue collar and middle-class folks from the Sacramento Valley. "They come for the free air-conditioning," says Lawson's Landing co-owner Carl "Willy" Vogler. The campground first came into the crosshairs of Marin County environmentalists in 1962. None of the moving parts that had kept the revenue flowing to the Lawson's—a sand quarry (now defunct), the cattle ranch (still operating), the camping—had operated with a use permit from the county. The boat livery is still operating, which is a rare sight at marinas these days because of liability concerns. You can rent an aluminum boat (the motor's extra) and head out to the bay for the day. There's also a boat-repair shop attached to the fishing and retail operation. The family has been trying to get use permits since before the advent of the Marin County Local Coastal Plan in 1980, but to no avail, say Lawson family members. "We've been working with, and sometimes against, the agencies, trying to get things permitted," Vogler says. The coastal plan is essentially the local reflection of mandates contained in the state Coastal Act of 1976 that created the California Coastal Commission. The campground's footprint has shrunk from 100 to about 20 acres, and you can feel that the squeeze is on. There are a few abandoned public restrooms that tell of the downsizing. Tent campers are now slotted into small patches of grass, and everyone seems to be right on top of one another. The owners returned 465 acres of campsites back to wetlands as part of an ongoing settlement arrangement with the coastal commission (a "consent cease and desist"), and in exchange were given the green-light to grow-out the tent camping in less sensitive areas. That hasn't happened yet. "There's work to be done," says Vogler. "It will take tractors and time," and the latter is in short supply in the summer. The 465 acres comprised the most eco-sensitive parts of the Lawson's holdings, and they put the acreage into a permanent conservation easement with the federal Natural Resource Conservation Service for $5 million. Meanwhile, the family hasn't been able to move on the part of the redevelopment plan that would allow them to put in new camping areas in other parts of their land. The Lawsons now say that a much-anticipated coastal commission scientific survey (which, they stress, they were not required to do) has been so long in coming that it's handcuffed them from making the necessary changes that would keep them in business. The survey is a necessary precondition for the family to start dealing with critically needed wastewater infrastructure. New bathrooms and shower facilities are part of the deal, among other upgrades. The family says it can see a viable business on the other side of this complex and multimillion dollar transition—but getting from here to there without going out of business in the process? That's another story.